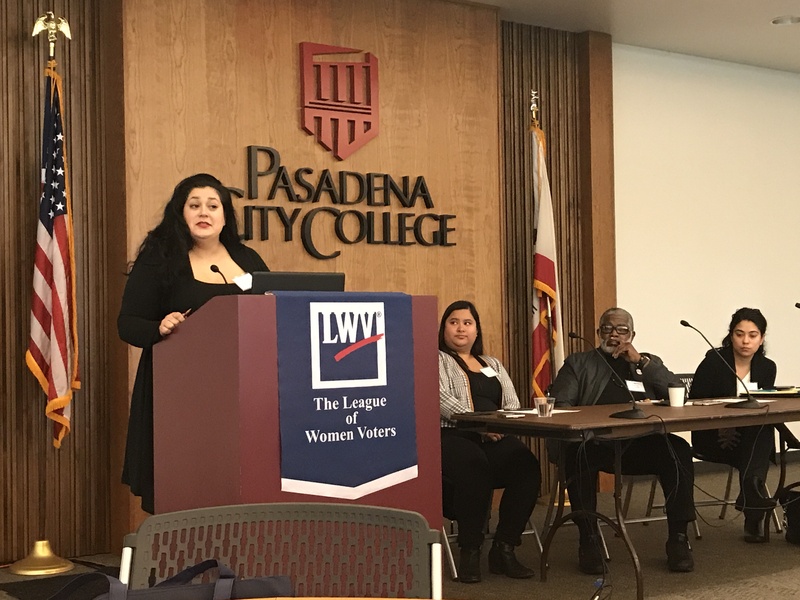 For Winter League 2019, the Los Angeles League of Women Voters provided a continental breakfast and invited a panel of speakers, who focused the discussion on working with ethnic organizations. Torrance Area League members Emma Simmons, Gloria Gutierrez, Lola Unger, Barbara Barker, Sharon Alexander and Jill Verenkoff attended the event at Pasadena City College. The three speaker panel introduced their organizations, and a moderated Q & A followed. Rev. Jonathan Moseley ended the session stressing the need for unity. NAN - National Action Network - Rev. Jonathan Moseley, Vice President, NAN-LA N.A.N is one of the leading civil rights organizations in the Nation with chapters throughout the entire United States. Founded in 1991 by Reverend Al Sharpton, NAN works within the spirit and tradition of Dr. Martin Luther King, Jr. to promote a modern civil rights agenda that includes the fight for one standard of justice, decency and equal opportunities for all people regardless of race, religion, ethnicity, citizenship, criminal record, economic status, gender, gender expression, or sexuality. NAN works to ensure that every vote in every community across the nation is counted. NAN is leading the fight against voter suppression and voter ID laws and NAN has led voter engagement tours to register and educate voters. C.A.U.S.E - Center for Asian Americans United for Self Empowerment - Audrey Soriano, Manager of Leadership Development. Audrey is responsible for implementing and supporting CAUSE's leadership development programs. She is excited to work with CAUSE in its efforts to educate and inform the APA community through political and civic empowerment. Audrey gained work experience through internships and fellowships with the League of Women Voters of Los Angeles and Los Angeles City Councilwoman Nury Martinez. Her work within the Filipino American community as Regional Field Director for the AD51 campaign for State Assembly inspired her to continue empowering political participation and civic engagement within the Asian Pacific American community. Audrey graduated with a Bachelor of Arts in Healthcare Policy from Mount Saint Mary's University, Los Angeles. C.A.I.R - Council on American-Islamic Relations - Asmaa Ahmed is the Policy Manager at the Greater Los Angeles office of the Council on American-Islamic Relations (CAIR-LA). CAIR is the nation's largest Muslim civil rights and advocacy organization. In her work as a policy manager, Asmaa organizes around and advocates for issues impacting Muslims, immigrants, refugees, women, communities of color, and all vulnerable populations. As a frequent public speaker, Asmaa has had the opportunity to speak at Islamic conventions, interfaith gatherings, community events, and the LA Women's March. She received a Bachelor's degree in Sociology from the University of California, Los Angeles and a Master's degree in Public Policy from Pepperdine University.